When I admit that I love watching The Bachelor (now in its 23rd season), I hear a lot of condemnation and concern for my well-being. Over the course of several weeks in the reality TV series, a bachelor and a gaggle of promising suitors will crisscross various cities and countries. They will jump feet first onto some of the most exotic beaches around the world before quenching their thirst at a “Cocktail Elimination Party.” At the “Elimination Ceremony", also known as a “Rose Ceremony,” if you do not receive a rose, you are sent packing. The season concludes with a much-anticipated dramatic finale leaving the eligible bachelor at the altar with a final selection between two last contestants, one rose and an all-important potential proposal still left on the table. All of this will end with tears, lots and lots of tears. In full disclosure – I have been watching The Bachelor since it premiered in 2002. I came across it quite by accident while visiting my mom at her condo. My mom, then in her 80s and living alone, was hard of hearing and refused to consider any form of amplification. But what she fully accepted and did need most of all – was company and comfort. When I stumbled upon a show that paraded an array of sequin-clad beautiful women coming out of a limousine and introducing themselves to an easy-on-the-eyes bachelor, I was intrigued and so was my mom. Happily, it turns out dialogue is not the most important feature of these programs, the scenery is! My mom was instantly entertained, and this ritual of watching both The Bachelor together was something my mom and I looked forward to every week. For me, those cherished memories of our time spent together speculating on who will be next to get eliminated or wondering whether there will be any wedding bells at all – will always hold a special place in my heart. Then, I noticed that this TV show provided me with yet another unexpected enjoyable side effect. There is no disputing that The Bachelor (or its counterpart The Bachelorette) is mindless drivel. No one is comparing it to PBS’s Downton Abbey or suggesting that it has the calibre of a Shakespearean tragedy, although passionately charged elements do present themselves in both. However, for me, this TV series has been nothing but therapeutic and a pleasant diversion from CNN. I set my judgment aside but not my bag of butter-flavored smart popcorn, and allow myself to be all in and fully subsumed. 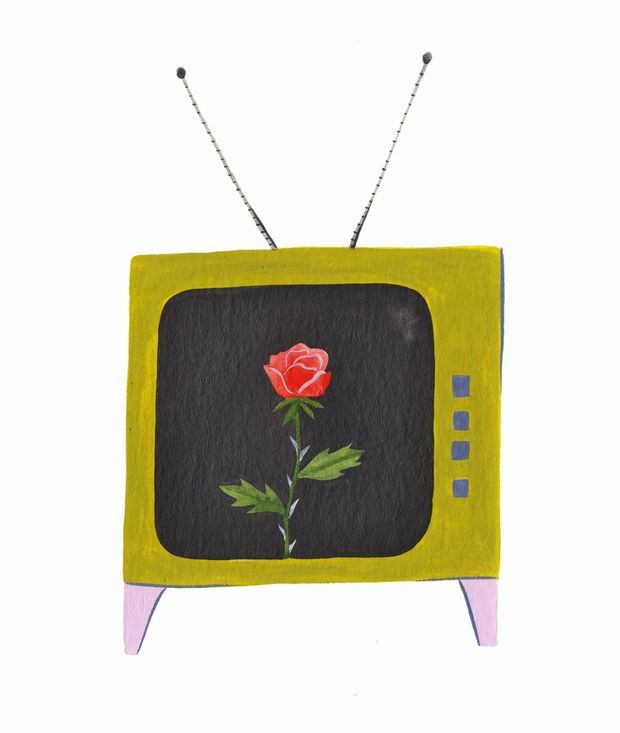 What this TV program manages to do – despite unfortunate controversies every season – is allow me to spool backwards in time and reminisce about my own dating nightmares – I mean experiences. Not all were horrible, but all of them invoked the same giddy anxiety-ridden sentiments. As I watch the current the bachelor/reality-TV star embark on his or her rose-petalled path to matrimony – I relive how I met my own Prince Charming and what that immediate attraction felt like and the exhilaration of falling in love. I can recall with total clarity that first date, from what I wore, where we went and the flutter of electricity that ran through my body when he reached out to hold my hand. This TV show with its now familiar cheesy line, “Do you accept this rose?” reminds me how much we all just want to be loved. When I mimic that line for my husband and he recoils (on some days) or stifles a giggle, I learn again just how vulnerable our hearts can be, and that for any relationship to thrive you need balanced proportions of respect, trust, patience, kindness and a strong sense of humor. This incredulous TV show is saving me a fortune in marriage counselling. Every time I sit down and watch the TV romance spectacle unfold, I find myself feeling increasingly more satisfied with my own life. I do not have to raise my blood pressure by reluctantly climbing into a hot-air balloon, zip-lining my way through a tropical rain forest or scaling the wall of the tallest office tower to prove to my man that I am insanely fearless and up for anything to win his heart. I can get my man to notice me with a mere smile, or simply appearing in a semi-good mood. When you are with the same partner for more than 25 years, you take delight in the simpler less life-threatening things. I watch each episode of The Bachelor with genuine gratitude that I do not have to navigate my way through the sometimes volatile and unstable minefield of the current dating terrain. I can relax and appreciate how far I have come from who I was in my insecure 20s, to today – someone who embraces imperfections and has realistic expectations within my relationship and especially within myself. What a great reality check to stem from a TV show so rooted in public ridicule and flouted as unreal. Wendy Reichental lives in Montreal.